Want to see all homes for sale in Stonemill? Click the button on the right. When folks think of Oklahoma chances are they think of farming, hard working cowboys and flat dusty prairies. Well, they'd be right. And wrong, as there is so much more to this dynamic state. As a matter of fact, Oklahoma is a state who can boast not only wide prairies but soaring mesas, red clay valleys, rolling green hills and believe it or not, more shoreline than the Atlantic and Gulf coasts combined. Yes, Oklahoma is a land of great diversity. Oklahoma City lies in the heart of Oklahoma, a thriving metropolis made up of dozens of subdivisions, suburbs and even small cities. The area has seen rapid growth and continues to grow. The cost of living here is lower than many parts of the country, unemployment is at an amazingly low 3.5% and the construction of new developments has builders at work all over the community. Especially in the northwest part of the city. Stonemill, Oklahoma City, OK realty is one of the many new developments, although this one has folks talking. The subdivision is designed by the renowned, award-winning developer David Yost, who is known in the community for producing high quality neighborhoods and for his commitment to conservation. A stellar reputation and high standards are what Yost demands of his own work, and he also requires this of builders on his projects. Prospective home buyers can be assured that all Stonemill builders have been screened and approved by this developer, which translates into superior quality. Much of the architecture features beautiful Old World European elements, such as the stonework of French Country and the half-timbering of the English Tudor styles. Each element and detail is well thought out and exudes warmth and comfort. Street lighting and signage provide continuity to the style making each and every home an extension of the community itself. Residents of the subdivision enjoy a thirteen acre park with seven walking and hiking trails. An insightful Yost knew the area lies within a region known as the Crosstimbers and used it to the homeowners advantage. 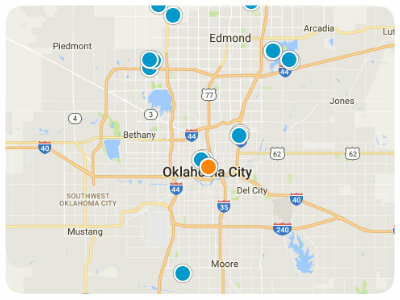 Homes for sale in Stonemill, Oklahoma City, OK give newcomers a chance to live an unparalleled quality of life. Behind the impressive stone and wrought iron entrance gates is a community devoted to natural beauty and rustic charm. The area is especially ecologically rich, containing more than fifteen species of trees, five of which are types of oaks. In fact, the Oklahoma Historical Society states, it would be inaccurate to describe the Crosstimbers as simply a forest, rather it is a mosaic of forest, woodland and prairie. Dozens of species of animals and birds thrive among the trees and grasses. The endangered Black-capped Vireo and the Least Tern can be found living among the Post Oak and Blackjack, the Black Hickory and Red Cedar and the Indian and Big Bluestem grasses. For its beauty the location is phenomenal, but it is equally fantastic for its convenience. The community is located on Northeast 122nd Street, between Bryant and Coltrane. By way of the major thoroughfares, Interstate 35, the Broadway Extension Highway and the Kilpatrick Turnpike the community is minutes from both Edmond and all parts of Oklahoma City. 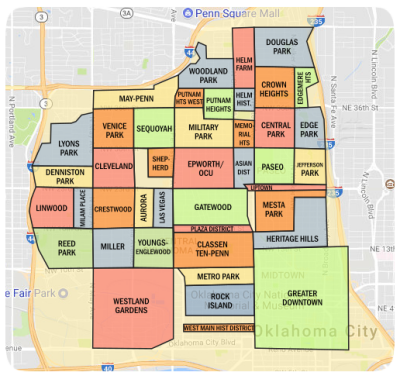 The really terrific news for families is that the area is served by the Oakdale and Edmond Public School Districts, each of which are rated as superior. Oakdale serves grades pre-kinder through eighth, while the Edmond Memorial provides for grades nine through twelve. Anyone who desires a great quality of life, in a picturesque environment, with excellent schools and the security of knowing they have a first-rate product will love Stonemill.